I use Tor Browser 7.5.2 on Windows 7 and apparently I can't post question on tor.stackexchange.com (this website), I usually always post question on stackexchange using Tor but this time I can't (see my screenshot bellow). For my part I'm not going ask all questions I'm willing to if Tor is blocked on this website this look like "censorship in upstream"
"QUANTUM to degrade/deny/disrupt Tor access? " If you are using Tor and it says abuse is originating from "your" network, it means the network of the exit node. Not your real network. To fix this, select the Tor browser button and select New identity or New Tor circuit for this site. If it still does not work, close Tor browser and open it again. Repeat until the message is gone. 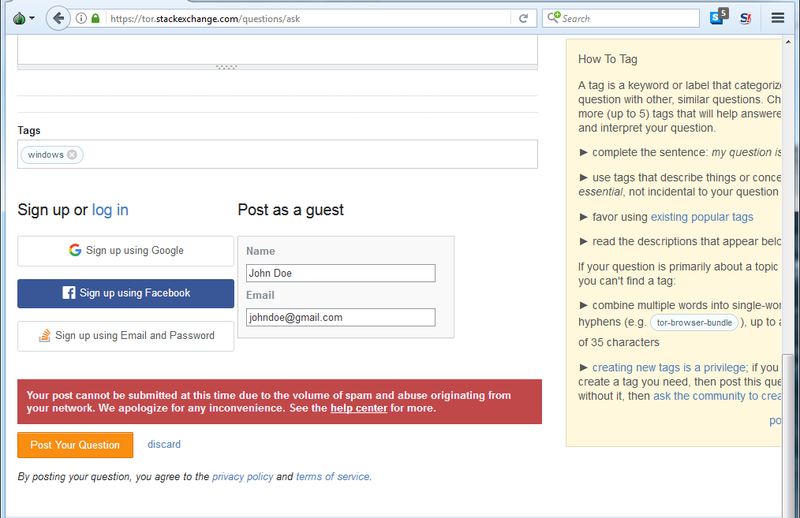 I find that it is easier to make a dedicated Tor Stackexchange account and log in before posting a question. This sort of denial of service is caused by spammers who posts their spam on this site proxying through Tor. Not the answer you're looking for? Browse other questions tagged tor-browser-bundle censorship or ask your own question. Using Tor in Iran for the first time. User Guide. Why can't I connect using an older version of Tor?